On Public Strain, I constantly feel like I’m staring at an unrecognizable and clawed-at photo. It looks familiar. Like a friend or a place that I know well yet can’t firmly identify. I continue to pull the photo closer and begin to enjoy the imperfections (faded color, ripped edges and wrinkled integrity) and no longer feel or desire any relation to the subject. By no means is this record a grower, it simply sets a tone that is so unexpected and beautifully detuned. It also does a hell of a job of putting your mind in a dark place. 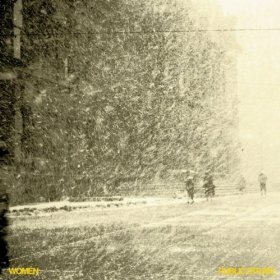 Women’s sophomore album expands upon their Velvet Underground-inspired pop by deconstructing it one brittle pluck at a time. Opener “Can’t You See” drones with controlled feedback, strings and vocals that are so distant and uncaring. There’s a triumphant joy within the lack of clarity, but there’s also no sign that Women want to be held close or understood either, and that makes complete sense with what comes next. “Heat Distraction” is full of wrecked guitar picking that sounds lost yet strategically placed in every repetition within its oddly shaped time signature. It’s the sound of a group reshaping post-punk into their own mangled vision of experimental pop. “Narrow with the Hall” takes a more direct approach. It follows a linear and distorted guitar note then erupts with a wash of noise that rivals a thousand fuzzy televisions losing their signals. If you feel disoriented then the album is doing its job. “Bells” is the beginning of the second act (Women beginning to shed some light where it was once completely absent). More remote than the opening number, the song crawls along with sad, moaning strings. It’s apparent that there’s real pain and fear being revealed in the murky vocals and songwriting. “China Steps” takes that fear and strangles it with aggressive guitar picking and heavy down strokes — almost snapping the strings. It’s as if the guitars are talking to each other, but they’re also falling apart against a thick and hypnotic drumbeat. And the fact that you can hear the mechanics and spring in the kick pedal is brilliant. While there are so many moments of uncertainty and mystery “China Steps” left every sound and detail open to the listener. And the band continues to do so on the tense jabbing of “Drag Open”. Sonic Youth fans will adore the chiming and driving dissonance during the chorus, the cymbal-less and primal pummeling of the drums, and a breakdown that is delicate yet way too sharp and jagged to get close to. The first time I heard this song I completely lost track of everything I’d been listening to in 2010. “Locust Valley” is bred from the same imaginary album that Sonic Youth and Unrest teamed up to create. It’s a more melancholic take on “Drag Open” only it sounds absolutely depressing. great review. can’t wait for my pre-order to arrive and to see them for the second time this year (on friday). yep, great review, great record. i think you like it as much as i do. Best record I’ve heard this year. best complete album I’ve heard in a very long time. It is becoming engrained in my bones and I like it. previously Greetings … Your blog is very interesting and I will definitely visit again. I have information about the hobby, maybe you’ll like it … ..